So many people of all races have taken to the Internet to read Clueless actress and Fox News token Stacey Dash her rights for her comments in response to Jada Pinkett-Smith and Spike Lee calling for a boycott of this year’s Oscars. But should they all be clapping back though? Pinkett-Smith and Lee are clearly concerned about the lack of representation in the awards nominations and have specifically asked people of color to stop patronizing the show. Dash, in all her uninformed glory, has turned this into a straw man argument about integration and segregation suggesting that we should also get rid of Black History Month and the Black Entertainment Network (BET). While I think her words are ignorant and worth criticism, I am not convinced that the clapbacks I am seeing are actually helpful. It goes without saying that Dash is uninformed. First, the BET Awards are not racially segregated. Neither is the network. The awards show frequently nominates non-Black people like Justin Timberlake, Bruno Mars, Justin Bieber, and Sam Smith for awards. Those artists may also perform on the show and participate in other tributes from time to time. It isn’t like non-Black people are barred from the awards ceremony. Second, unlike OWN, BET isn’t even owned by Black people. It’s owned by Viacom. Similarly, Telemundo is owned by NBC. These stations are not “segregated.” They are targeted. There’s a difference. The idea that “we” have the BET network is ridiculous. The fact is: it is a station marketed toward Black people and owned and operated by Whites. It’s a sad truth but it’s the truth nonetheless. The BET Awards are no different from the Latino Music Awards and the Country Music Awards. This fixation on Black people having their own safe spaces to affirm and empower one another is a distraction from the fact that, without these safe spaces, we would go unrecognized for our talents and contributions to the entertainment world. 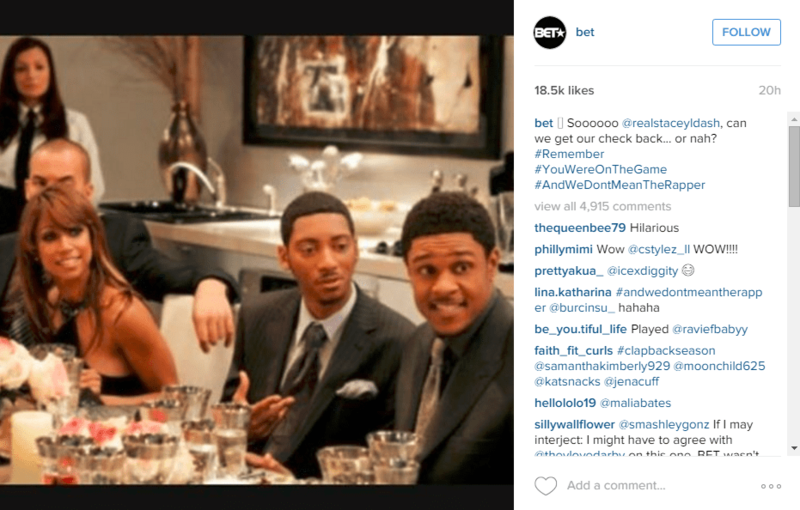 Even BET took to Instagram to clap back at Dash with this slightly icky, slightly misogynistic post asking for their money back. It’s petty but the only reason I’m here for it is because I think it is hypocritical to call for a network to be shut down when you are collecting a check from it. But, beyond that, my concern with the outcry I am seeing is that so many non-Black people have made it their duty to “educate” Dash about the necessity for BET and these awards shows. I see White folks, in particular, writing about how these awards shows are meant to combat generations of exclusion from mainstream entertainment. They are pulling quotes and stats to feverishly get this uninformed Black woman together. Frankly, if you’re White and you look like Kermit, pump the brakes. Full stop. Where were y’all when Rachel Dolezal created an entire Black family and tried to coin the term “transracial”? Where are y’all everyday when your own people deny the impacts of systemic racism and occupation of Black communities? Where are y’all when young Black and Brown people are protesting the violence against and divestment from their communities? Where are y’all then? If you can’t get your own people together, don’t get Stacey Dash or Raven Symone or Don Lemon together. Let us handle our people as we see fit. It just isn’t a non-Black person’s place to spring into action when a Black person says or does something harmful toward Black people. There are enough White people out there erasing, undermining, annihilating, and shitting on blackness to keep y’all very very busy.